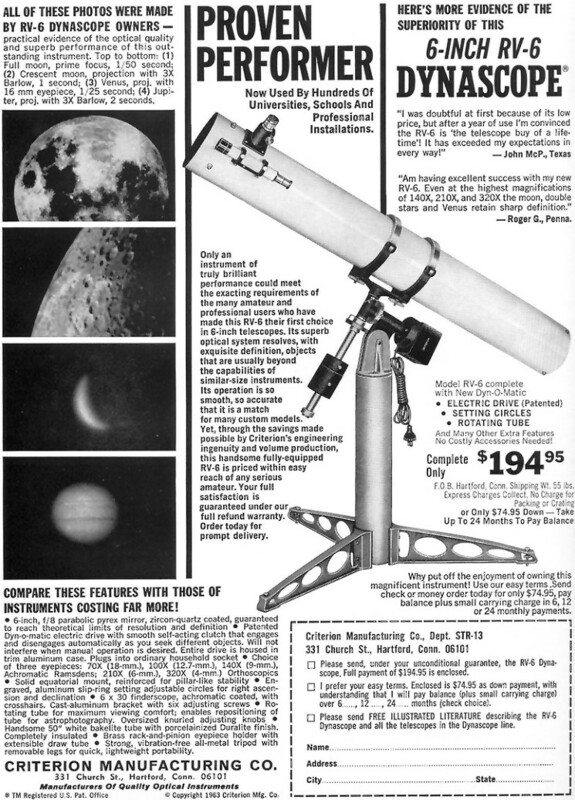 For a mere $279.95*, I could purchase a 6", f-8 Newtonian telescope with a pillar-type tripod mount and an equatorial drive. I immediately wrote a check and mailed it off to the company's location in Connecticut. Then, I waited... and waited... and waited, but no telescope arrived after more than three months. So, I to Criterion Manufacturing about the delay and got a response that the RV-6 Dynascopes were on backorder, but that it should arrive soon. Another couple months passed and still no telescope. I sent another letter and had no response. I called the listed phone number and got no answer. Finally, I contacted the Better Business Bureau in Connecticut and discover they were out of business and in bankruptcy. Thanks to the BBB representative, though, I was given a good contact number for one Criterion's executives and called to explain that the company had cashed my check within a month of the time sent, and that I was just a poor Air Force schmuck who couldn't afford to eat the $200 loss. He promised to send a refund. A couple more months passed without any refund. I had given up when, almost a year later to the day I wrote the check, a refund check arrived in the mail. I immediately took it to the bank for deposit before it could be voided by the company. So, the story ended better than it might have, but I still didn't have a nice telescope and there was no equivalent alternative that I knew of at the time. Today, of course, there are many such options available. * According to the BLS Inflation Calculator, the $279.95 price in 1980 is equivalent to $810.76 in 2015 money. 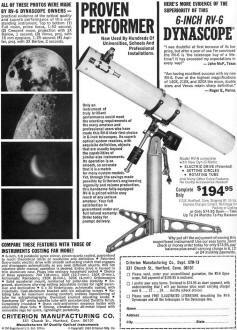 The advertisement shown is from a few years earlier, hence the lower price.